As a kid, my family always had St. Patrick's dinner at my maternal grandmother's house - she was Irish, and always made a full holiday spread. For the kids, we even got a few drops of green food coloring in with our milk! But yesterday was St. Patrick's Day, and for the second year in a row, I didn't have a single bite of corned beef and cabbage. It's interesting, because I'm typically not really crazy about beef - I'll take poultry over beef any day. But corned beef is definitely an exception. I might have made some yesterday if I had a group to entertain, but with just myself, it was easier to just abstain entirely. 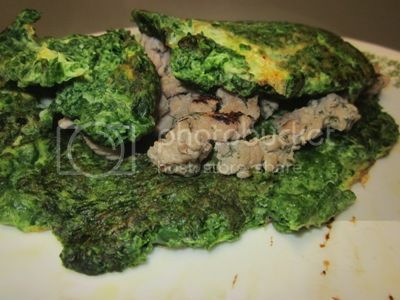 Breakfast: egg white omelette with spinach and ground turkey. First I browned the ground turkey with some garlic and dill (double green!). Then I finely chopped the spinach in the food processor, mixed it in with egg whites, cooked it up like a regular scramble, tossed in the turkey, and voilà! Very delicious and very filling for just under 300 calories. Snack: a D'Anjou pear. 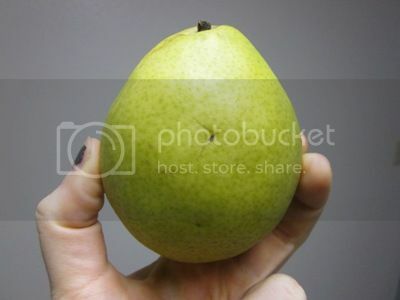 I have been loving pears lately. Semi-related, I loved them so much when I was a kid that my dad called me "Mairzy Pears," or sometimes "Pears in Light Syrup." My family is big into long, ridiculous nicknames, and I couldn't love it more. Lunch: a small banana, plus a whopping 100 calories for a giant tray of roasted asparagus (plus whatever calories are added with the spray). I lightly spray them with olive oil cooking spray, sprinkle them with whatever seasonings I am in the mood for, and roast them at 425º for 22 1/2 minutes. I usually just do a little salt and black pepper, but today I went with Greektown-inspired seasoning, one of my favorites from The Spice House. It's a bit lemon-y, with oregano and other goodness. I don't use it often because it's a lot of salt and not a lot of herbs, but a little pinch goes a long way. Dinner: what was left in a box of pasta (about 4/5 cup), a small chicken breast (about 4 oz. ), and roasted broccoli (cooked the same as the asparagus - had some mixed in with the pasta, lots just eaten as-is!). I had a lot of fun with this, and I think I might try and make it a semi-regular challenge. Pick a color, and stick with it all day. Red, green, yellow ... easy-ish. Blue? A bit more challenging. But it would certainly be interesting! 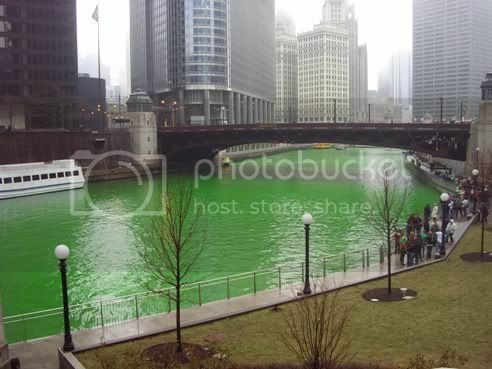 It was weird to not be in Chicago for St. Patrick's ... first time in a few years I haven't seen the green river! My picture from last year *sigh* It rained all day and was pretty cold (for central California, anyway) - I thought about ditching my daily run and ending my streak just as it was getting started. I dreaded it all day, but finally accepted that "you know, it's only cold out there when you stop running..." So I got out there and did it anyway - a mile in 9:31, then walked for a bit, then ran another 1/4 mile in 2:11, then walked the little bit home. Not much, but I'm glad I got at least a little workout in before the daylight disappeared ... and I'm glad my streak is still going strong! I know I promised a write-up on Matt Fitzgerald's "Racing Weight" today, but since my idea for a recipe post turned a bit into a photo dump post, I'll be giving his book a whole separate post on Tuesday. It was such an important read, and my post will be fairly long ... so I didn't want all the great info to get lost among pictures of the things I ate yesterday. What about you? Did you partake in any St. Patrick's festivities? How do they "un-green" the river again? I'm not Irish, so we didn't really celebrate St. Patrick's Day growing up. Occasionally we had corned beef. I don't like it or pastrami. So yesterday I made shamrock shakes and that was the extent of our celebration. I am making my mother's cabbage "stew" which is the Italian version or corned beef and cabbage- browned ground beef, chopped cabbage, potatoes in a tomato sauce. We'll have rice or egg noodles with it. I didn't, but did reminisce on my mother's delectable corned beef and cabbage. Something that has not tasted the same since she passed. The green river is really cool. I never knew they did that! Mary, I love that you ate all green food(s)! So awesome! I cheered on the Get Lucky 21k (half-marathon) runners in Saint Paul on Saturday morning and it was SO FUN!!! My daughters birthday is on St. Patricks Day, so we celebrated her birthday yesterday, went to a parade, I ran in the morning. Long day! I loved your green food challenge! I love the green foods idea! Wish I had thought of it! Great job on your mile run. I would love to do it in 9 minutes. I'm still around 16 or 17 minutes. I have a long way to go! I don't want to make you jealous but I spent the weekend in Chicago. It was 80 degrees all weekend, saw the green river and some of the parade. Walked all over downtown enjoying the sights and people-watching. I've never seen as many people in Chicago as I did this weekend. It was packed with humanity! What a wonderful time it was! I love your food theme for the day! 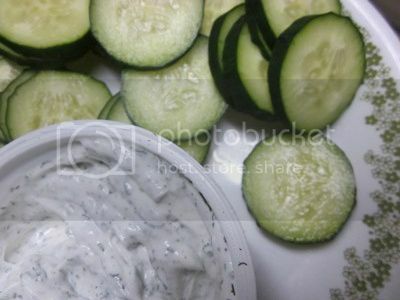 And if you're ever in the mood to tweak your greek yogurt dip a bit (and add green! ), mash in some avocado. HOLY WOW.